The subtitle of this new book says it all: “Avoiding the Pitfalls of Approval-Motivated Leadership“. The author is Charles Stone, lead pastor at West Park Church in London, Ontario and founder of StoneWell Ministries. There is definitely a need in the Body of Christ for this very important book. I know first-hand from church consulting, that often because of their public position; pastors and ministry leaders feel they can’t be open about their weaknesses, past wounds, or sense of inferiority. Unfortunately, those without any appropriate accountability and encouraging relationships, often have the tendency to fall into a rut of confusion, frustration, and potentially an extremely immoral sin or crime. Hopefully, with the ministry of the Holy Spirit and the findings presented in this study, more pastors will seek inner-healing and will be able to serve the Bride of Christ fruitfully and faithfully. “People-Pleasing Pastors” is part pastoral care for ministers, part personal discovery and self-awareness, and part psychology and neuroscience. The author describes his work as a “3B” approach: the first B is for the “Bible”, the source of all written truth. The second is for the “brain” and corresponding functional MRI research. And finally, the third B is for “Bowen” as in Dr. Murray Bowen, a psychiatrist who developed a perspective on how people process their internal world, as well as relational issues and dealing with difficult emotions like anxiety. The seven steps Stone provides for a solution can be remembered with the acronym “PRESENT”. In sequence they are “probe your past”, revisit your values”, “expose your triangles” “search for your gaps”, “engage your critics”, “nurture your soul through mindfulness”, and “tame your reactivity”. Stone has a pretty extensive family genogram exercise that he recommends, in chapter 4 “The Rearview Mirror Look”. For me this was the most helpful chapter of the book and has surprisingly stayed in the background of my thinking, far longer than I thought it would. This process of reflection is especially helpful when it comes to analyzing your family’s history and how that shapes your personality. It is also eye-opening when the topics of unhealthy generational cycles and the effects of ancestral sins are exposed. Some of the questions Stone suggests pastors work through include asking “what effect did birth order have on your family?” “Do any addictions run in your family?” and “How did your family handle anger and conflict? The good news is that Stone also offers advice on how to find freedom in Christ, and reminds pastors that they are not imprisoned by the negative events of their past. These unresolved issues however if not addressed, are typically the main contributing cause for the desire pastors have to please congregants and avoid confrontation. Statistically backed up by a large survey of one thousand pastors done through LifeWay Research, Stone presents his “PRESENT” solution with relevant findings, sound biblical reference, and helpful practices for moving forward, listed in Appendixes’ A and B: “The Seven-Day Personal Development Plan” and “The Eight-Week Team Development Plan”, respectively. In the first addendum, Stone unpacks two more acrostics, “BEETS” and “RIPE” and explains how each can help pastors move from trying to make people happy, to ministering to their felt needs. Each section of the book has a “chapter snapshot” and includes a “take away” list of comments and questions. Included are snippets of advice and wisdom from some well-known pastors, such as Dave Ferguson, Pete Scazzero, Lance Witt, and Dr. Elmer Towns. 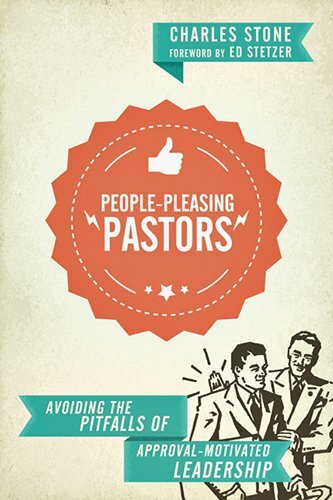 With a foreword by Ed Stetzer, and supported by strong endorsements from Thom Rainer, Larry Osborne and Aubrey Malphurs, I highly recommend “People-Pleasing Pastors” and the lessons it teaches on the inner-workings of a leader’s life. That’s why I am so thankful to Charles Stone for producing this study and to IVP Praxis publishing the book and providing this reviewer with a complimentary copy. For further reading on the inner health of pastoral leaders, I’d suggest Kevin Harney’s book “Leadership from the Inside Out: Examining the Inner Life of a Healthy Church Leader” (2007), “Overcoming the Dark Side of Leadership: The Paradox of Personal Dysfunction” (1997) by Gary McIntosh and Samuel Rima, and “Leading with a Limp: Take Full Advantage of Your Most Powerful Weakness” (2006) by Dan Allender.